HEX-FLX Flywheel Coupling Installation on Scissor Lift | Hayes Manufacturing, Inc. 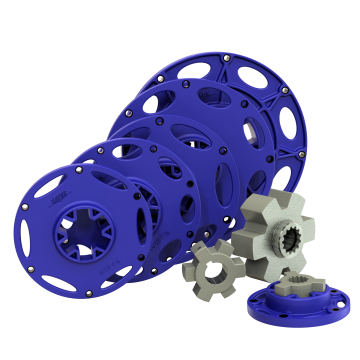 The HEX-FLX Flywheel Coupling provides operation below critical speeds with its high torsional stiffness. It minimizes spline fretting and has the best shaft clamping abilities in its class (Patent No. : US 7,645,089 B2, Jan. 12, 2010). This coupling may be blue, but don’t let it get you down. Replacing existing couplings of similar design with the HEX-FLX may even put a little $$ back in your budget. When installing onto straight keyed shafts, be sure your key is the full length of the flywheel coupling body. If this is not done, warranty will not be considered in the event of a failure.